Have you been eating berries? I’m not really a Valentines Day type of gal. I suppose my disinclination is due to the truckloads of fluffy naffness. Perhaps it’s because I waited tables one year in Washington DC on Valentines Night and the snippets of overheard conversation have stayed with me for life. Scarred!!! But it’s mid May now so I think it’s a safe enough distance away from February to make heart-shaped food. The reality of this gesture today though is more genuine. I just want to tell those who’ve helped me build this place that I love them. (And I get to cook). 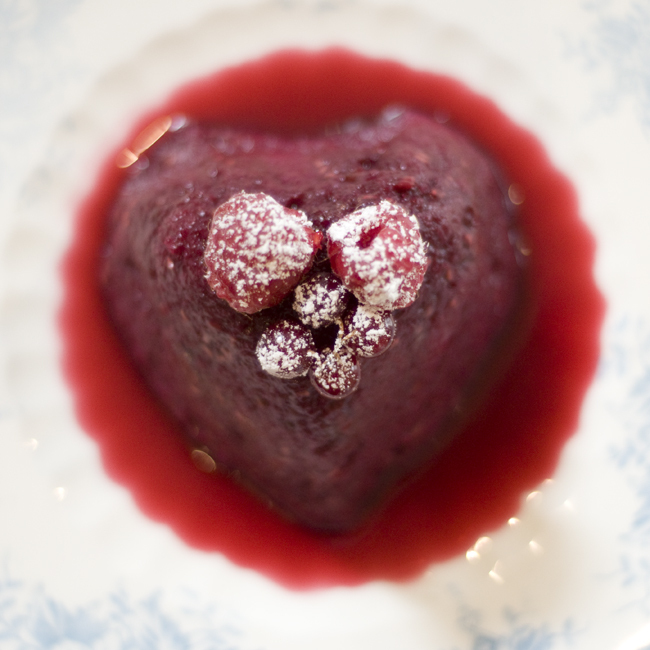 My heart-shaped offering is a Summer Berry Pudding. It’s pathetically easy to make and you can easily make it in a non heart-shaped bowl (which the recipe below matches). I found my small heart shaped bowl a few years ago. It’s for salt and comes with a little spoon. But shape aside, there’s an awful lot to be said for not littering the hob with pots and pans (there’s just the one for this recipe) and this is the perfect food for berry lovers (which are, as we know, the best kind). 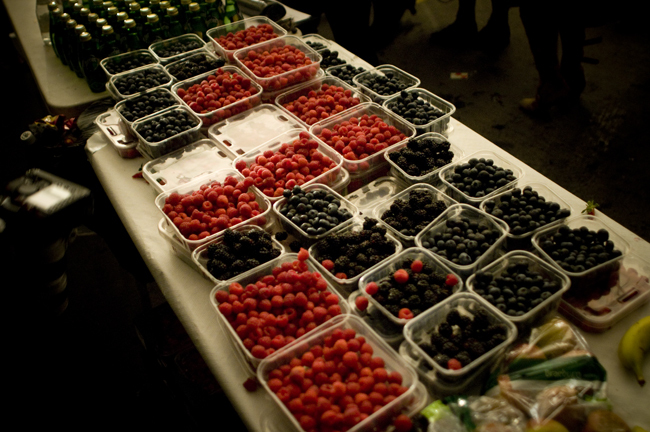 I’m struck every season at the tables of berries that Vivienne Westwood provides backstage at her fashion show. Do I have to even go on? 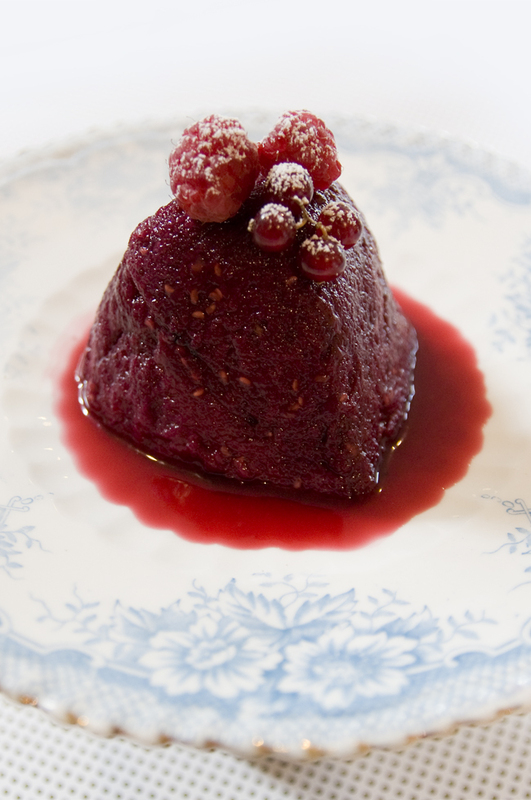 And while Summer Berry ‘PUDDING’ may not seem the most seductive of words (not like Tiramisu or Sorbet or Eaton Mess is it? ), the fact that the colour conjures up happiness makes it a winner. Humour me. It’s my queen of puddings. 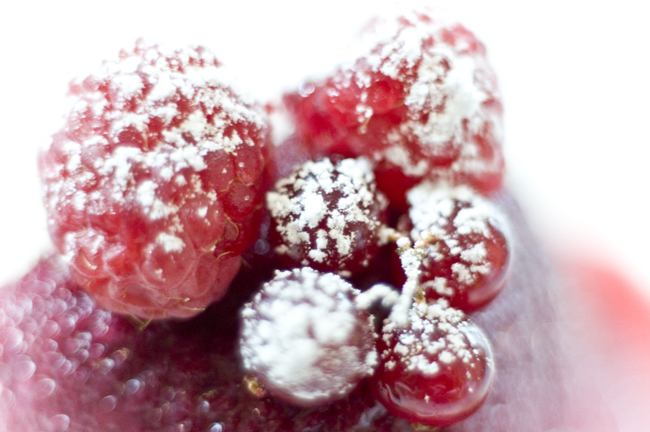 You can use any type of berries – raspberries, blackberries, blackcurrents, red currents – depending on what you like. You can serve it with Mascarpone cream (cream and vanilla extract whipped into Mascarpone), vanilla ice-cream or whipped cream. I do neither and just serve it on its own! 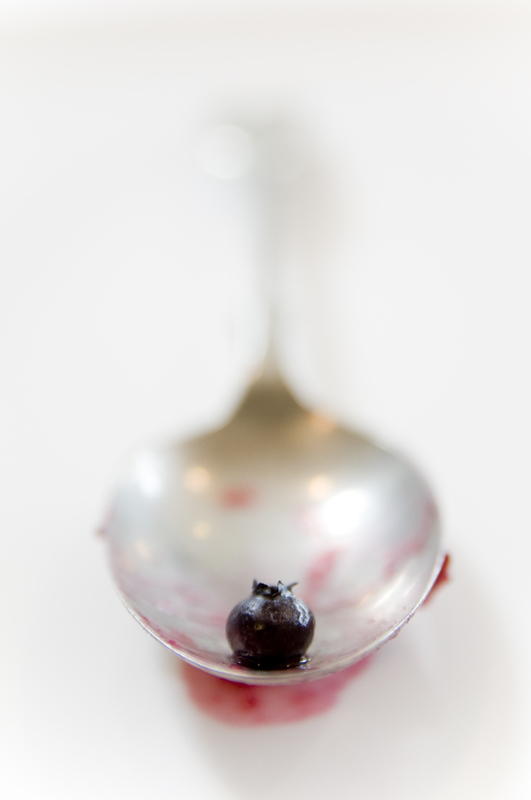 Place the berries (keeping a few back for decoration), sugar and 60ml (2fl oz) of water in a large saucepan and heat gently and simmer on a low heat for 3-4 minutes until the fruit softens and a rich, dark juice starts to rise around the fruit. Set aside to cool. Cut the crusts from the bread and cut two circles one to cover the bottom of your mould/bowl and one to fit the top. Cut the remainder into triangle slices about 1/2 cm (1/4 inch) thick. Dip both sides of the bred pieces in the berry juice and then line the bowl with the smaller circle of bread first at the bottom and then continue to build your shell with the juice soaked bread. Overlap them slightly to make sure there are no gaps. 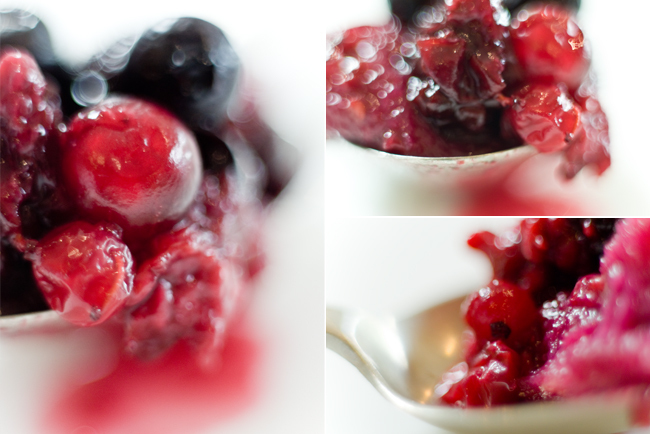 Spoon the berries into to bread lined-bowl and drizzle with any remaining juice. YOu can patch here and there if there are tiny holes and then finally top with the larger circle of bread, trimming it to fit. Cover the top of the pudding with clingfilm and then find a plate that fits perfectly inside the rim of the bowl and sit it on the large bread lid. Press the plate in, then find something heavy and weigh it down (a heavy can or two). Place the bowl in in a shallow dish to catch any juice that might overflow, and refrigerate overnight (for at least 12 hours). Can you tell my face was red when I wrote this? A few weeks ago in Milan I was laughed at for ordering a cappuccino at suppertime. I replaced my order with a latte and they laughed even more! Apparently the Milanese only drink milky coffees (cappuccinos, lattes) at breakfast and prefer a tiny espresso after supper. To be honest, I find espressos a bit strong so I asked for an espresso with loads of milk. Blank stares! 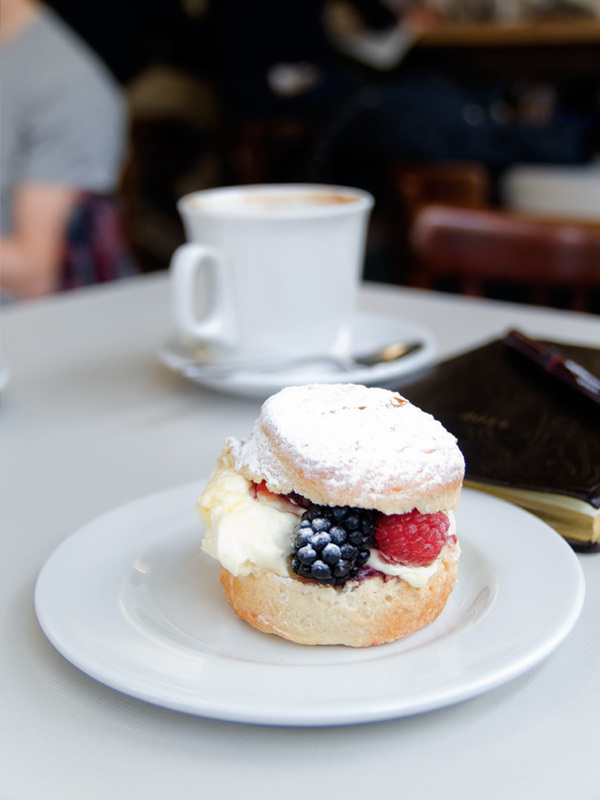 This week, I’m feeling a little less embarrassed because I discovered Allpress on Redchurch street with my friend Mark. I mentioned my Milanese experience to them and they introduced me to my first “flat white” — or “flattie” as it’s known in its native Australia and New Zealand. 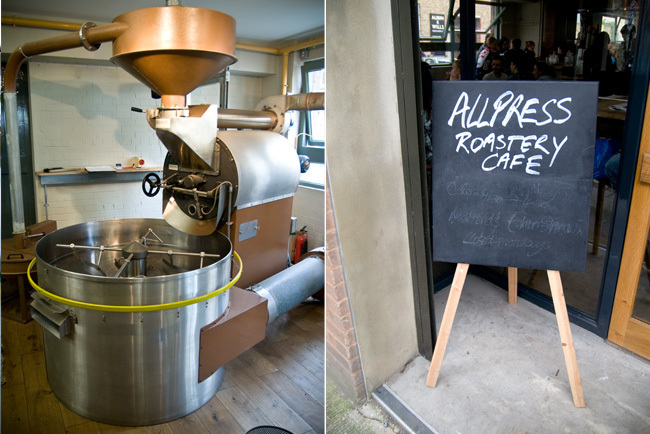 The enormous roaster inside the window at Allpress was a good start. Sure enough, the “flat white” they suggested made from the finest of beans was exactly what I was asking for (but couldn’t get) in Milan. I didn’t know initially why I liked the “flat white”, it’s less foamy than a cappuccino but stronger than a latte, with a double dose of espresso, it’s basically a double espresso topped up with textured heated milk (milk from the bottom of the jug (no foam)). In the past I’d head up to Monmouth in Borough Market for a good drip coffee (they roast and sell some of London’s finest coffee beans) but it may be a while before I have to go again… I’ve been sucked into the underworld of the Australian coffeehouse and the “flat white” coffee. 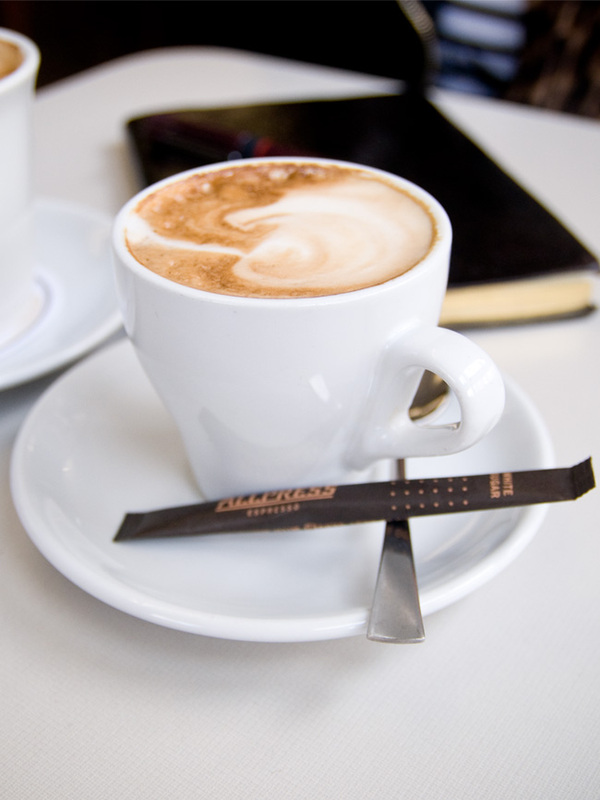 The Flat White coffee store (they initially introduced the “flat white” concept to London) and Milkbar both based in Soho do a good “flat white”. Kaffeine (has one of the few Synesso Espresso Machines in London and does a great “flat white” too). A quick skip across Oxford street to Fitzrovia where Lantana located near Goodge Street station / Tottenham Court Road does a brilliant one. All four places are within walking distance of Oxford street and Topshop but a quick hop on to the tube to Liverpool street and then down Redchurch Street to Allpress is my fave experience. 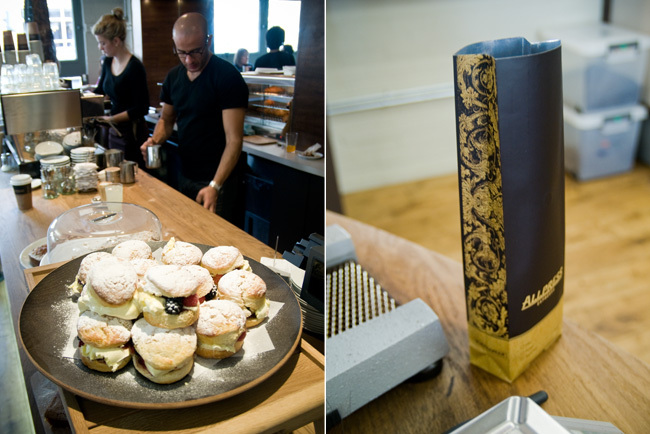 Allpress do alot more than a great “flat white” coffee, there’s a great communal table, fluffy white scones, and a Green Goddess sandwich; a poached egg, jamon, salad leaves and green herby mayonaisse stacked on ciabatta bread. The whole experience is adorable!